The Digital-Quad-H is VocoPro's latest edition in quality and reliable microphone sets. 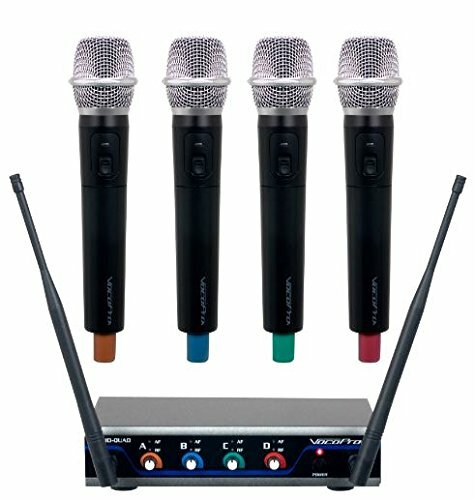 It's a 4 channel wireless system that's configured with handheld microphones. Operating in the 900Mhz band, the Digital-Quad-H is unaffected by the normal causes of signal interference and drop outs! And its professional quality 24-bit resolution audio will be heard clearly across its entire 200ft range. The Hybrid-Quad-H is show ready with its balanced XLR outputs on each channel, allowing for minute volume control; or use the ¼" mixed output for an easy connection. With 4 frequency sets available, accommodating even the largest groups will be a breeze! Simplify your microphone set up with the latest microphone system, the Digital-Quad-H by VocoPro! Utilizes The Sparsely Used 900MHz Frequency Band. 24-Bit Digital Technology Delivers a Clean, Professional Quality Signal. Individual Digital Microphone IDs Eliminates Channel Cross-Talk . Wide Frequency Response (50 - 20,000 Hz) Ensures Natural Sounding Vocals . Four Balanced XLR Outputs Available. One ¼" Mixed Output Available. Brackets Included For Mounting In a Rack Case . Four Different Frequency Sets Available; A total of 16 frequencies . Receiver Dimensions: 8.375"W x 1.250"H x 5.250"D. Rear Panel Connections: Power in, 1/4" Audio Out, 4 XLR Audio Outputs. Accessories: Mounting Brackets, 1/4" Patch Cable, Power Adapter.